After my beautiful, yet rainy, day at Plitvice Lakes National Park in Croatia, I felt like I wanted another day with nature. 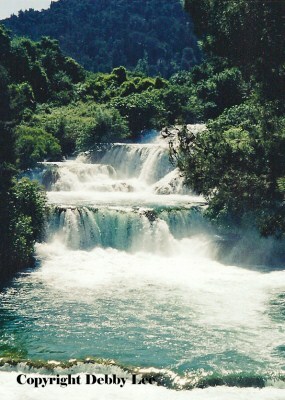 So I ventured to another National Park, Krka. Whereas in Plitvice, I was serenaded by sounds of frogs, at Krka, I was taken with the brilliance of the blue dragonflies. Today started out at the Croatian house in Sibenik that I was staying in, where the owner made me breakfast. Coffee and pancakes. I can’t remember the Croatian word for the pancake, but she told me she made them out of water, milk, and the yellow of eggs. Maybe she said flour, too. I put marmalade on them, and enjoyed a nice homemade meal. After breakfast, I went to the bus station where I caught a bus to Krka National Park. I first stopped, however, at the Franciscan Church in Sibenik. (Once again, another church, as I like to do a lot during my travels.) No one was inside, so it was peaceful. A good way to start the day. The sun was also out, unlike my rainy day in Plitvice, so even a better start for the day. I hopped on a bus to Skradin, the town right near Krka. The real entrance to Krka, however, was via a short boat ride from Skradin. My main goal for today was to take a second boat to a Franciscan monastery that dates from 1576, which was located on an island in the middle of a lake in Krka. 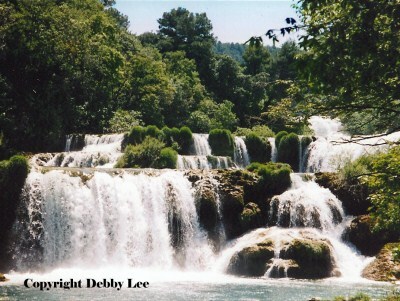 When I got to the Krka ticket office, I paid for my way into to the park. I was told, though, that I needed to buy the ticket for the boat to the monastery at a different place, where they would assign an allotted departure time, which turned out to be 2pm. I had a several hours to enjoy before the boat to the monastery, so I strolled along the main boardwalk around the waterfalls of Krka. There were fewer paths here than at Plitvice, so I actually had time to walk around them twice, including snack breaks. It was quite scenic, all the water and trees. At 2pm, I boarded the three-and-a-half hour boat tour, which actually made a couple of stops. The first stop was the monastery on Visovac Island. I believe that they said this island is only 100 by 150 meters (328 by 492 feet). Quite small. There were very colorful flower gardens, and a circle of cypress trees, surrounding the monastery. There was also a church, and a museum which contained interesting displays of both religious art and African art. The second stop on the boat tour was to a waterfall. 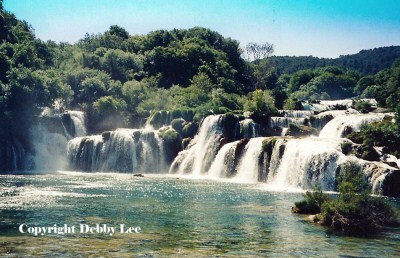 The lakes between the waterfalls at Krka were much larger than the lakes at Plitvice. (More comparisons later.) We got an hour at this stop (we had a half hour at the monastery), where I just took off and went for a walk by myself. I found a road following some streams and meandered for a while. It was here that I saw the blue dragonflies. Intriguing iridescent blue dragonflies. They were very pretty to watch as they fluttered around, and I spent some time just looking at them. I continued walking up and down the road, enjoying the waterfalls and the streams, and then made my way back to the boat. After the tour, I took the boat from the entrance of Krka to Skradin, and made my way back to Sibenik. Between Plitvice and Krka, I would say that Plitvice, even in the rain, was more impressive in some ways, but Krka was more impressive in other ways. Plitvice had a lot more waterfalls with smaller lakes, whereas there were fewer waterfalls in Krka, but the lakes were larger. There were definitely more trails and paths in Plitvice, as I explored there for hours on end. 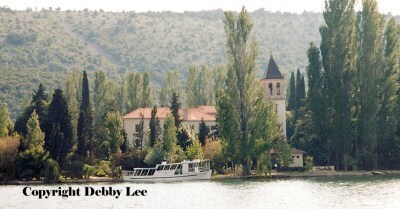 But Krka had the quaint and peaceful monastery on an island. Between the two national parks, I felt like I really got some good outdoor and nature experiences, and a sense of the beauty of Croatia. This is just gorgeous! I hope when I am in Europe I will be able to see this area.